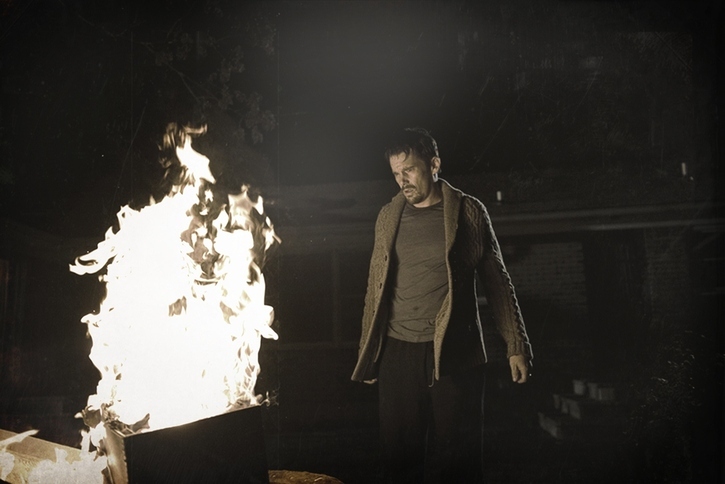 Sinister is writer-director Scott Derrickson’s atmospheric horror film that opened in fall of 2012, failing to really ignite at the box office. While lacking in terms of narrative momentum, it works well as an almost purely mood piece. There are not only some good “jump” scares, the overall feeling of evil lurking in the darkness is well sustained by Derrickson throughout the film. The slip of a plot involves true crime writer Ellison Oswalt (Ethan Hawke) moving into a new home with his wife Tracy (Juliet Rylance) and their young kids, Ashley (Clare Foley) and Trevor (Michael Hall D’Addario). Ellison is well known for his gruesome crime books and not well liked by many local cops due to his negative portrayal of law enforcement. The story begins with the Oswalt family moving into a new home. Unbeknownst to Tracy, their new house is a former crime scene; four people were hanged from a tree in the backyard. Ellison hopes to draw inspiration from the case. Before long, Ellison discovers reels of home movies left behind in the attic. They show different families being murdered in a number of horrible ways. Repeat viewings reveal a bizarre presence, a figure that Ellison has seen in children’s drawings also left behind with the films, a figure labeled “Mr. Boogie.” From that point on, Ashley begins painting strange things on her bedroom walls, while Trevor’s night terrors increase in severity. A significant weakness of Sinister is the general cluelessness of Tracy. She seems exceedingly slow to realize that something very strange is going on, easily sleeping through her husband’s frequent nocturnal explorations of the house. There’s not much to see here in terms of twists and turns, but the tension level remains high enough for Sinister to be worth a look. Ethan Hawke does a great job gradually building the madness and paranoia that slowly takes over Ellison. There are a few red herrings tossed in along the way. Vincent D’Onofrio turns up for a cameo as a college professor with some background on the mysterious Mr. Boogie. Deputy “So-and-So” (James Ransone) is a fan of Ellison’s writing (his nickname makes sense when heard in context). He earnestly attempts to help piece together a pattern in the various murders Ellison has seen in the home movies, hoping to be rewarded with an acknowledgement in the pending book. Fred Thompson has a few fun moments as a sheriff who believes Ellison is exploiting tragedy for personal gain. In fact, another underdeveloped element is Ellison’s internal struggle regarding his true motivations as a writer. He claims to be driven by the possibility of uncovering new details in cold cases that might eventually lead to a break. But deep down, he wants to be famous and admired. It’s an interesting subtext that unfortunately doesn’t really go anywhere. Lionsgate’s 1080p, AVC-encoded Blu-ray features a transfer that makes the most of Sinister’s deliberately underlit appearance. Christopher Norr kept his Arri Alexa-shot digital cinematography dark, almost unrelentingly so. Detail is often swallowed up by shadows, but that’s entirely intentional. This is a fine looking visual presentation, with plenty of detail evident in anything that is meant to be seen clearly. The grainy Super 8 home movie footage looks cool too, full of authentic scratches and debris. The DTS-HD Master Audio 7.1 audio maximizes the capacity for a surround mix to be creepy. 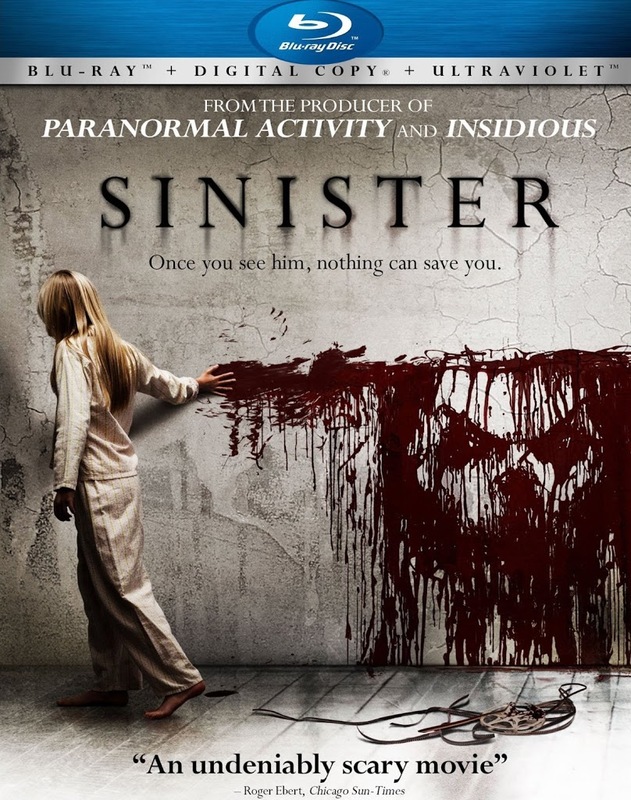 Sinister’s sound designers obviously subscribe to a “less is more” philosophy and it works. Creaks and odd noises emanate unpredictably from the rear channels. A couple of sudden, loud, bassy thumps are very well-placed within stretches of near silence. Christopher Young’s subtle score is also effectively balanced, expanding to the rear channels at opportune moments. 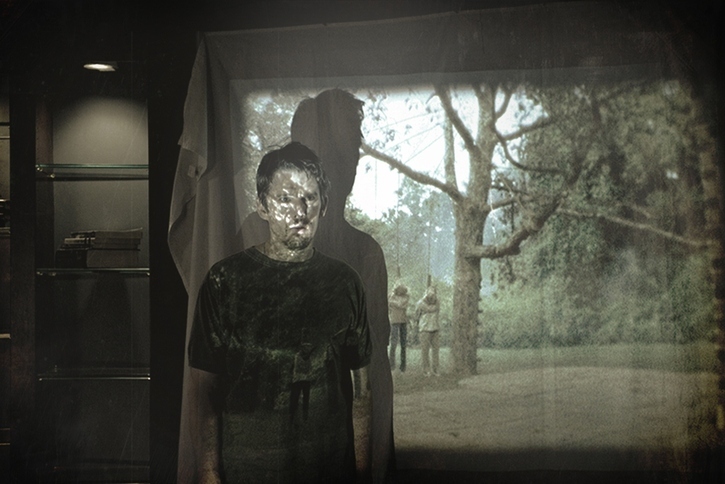 Two commentary tracks accompany Sinister, one with director Scott Derrickson on his own and the other with Derrickson joined by co-writer C. Robert Cargill. “Living in a House of Death” is a promotional featurette that runs about 10 minutes. “True Crime Authors” is more interesting as it includes interviews with a number of true crime novelists. There’s also a short selection of deleted scenes with optional commentary. Sinister isn’t a horror classic by any stretch. But it seems to mostly achieve what it was trying to be—a spooky mood piece about an extremely self-absorbed writer who has little idea what his cavalier disrespect for the forces of evil has gotten him into. It’s not as freaky as I would have liked it to be, but with a moody atmosphere, it still delivers the goods on being scary in the right way a horror movie should. Great review Chaz. The success of the jump scares and the creepy atmosphere is exactly what would really chill my bones. Those elements when done perfectly really do create an impact on me, to be honest. I could sort of identify that trademark from the trailer, but this review affirms it so I’m going to wait to see this movie until I’m ready to get spooked!